At CES 2018, AMD unveiled a number of updates to its product line and its roadmap for the future. A major push for AMD at CES 2018 is getting its Vega graphics integrated with different CPUs. That includes a small sliver of Intel’s CPU packages. Perhaps more importantly for the company, it also means integrating its Ryzen cores with its Radeon Vega Graphics. For those unfamiliar, APU is AMD’s nomenclature for CPU + GPU and has been the vision of AMD since it completed the ATI Technologies acquisition years ago. These chips are realistically the first generation where that vision is competitive on the CPU and GPU sides. We did want to point out a few tidbits on this chart. First, AMD is using “CTDP” here with ranges on the desktop parts and “nominal” ratings for the others. We would like for AMD to start using a more consistent measurement. Second, all of these APUs are dubbed “with Radeon Vega Graphics” except the Ryzen 5 2400G with Radeon RX Vega Graphics denoting that it is the fastest of the bunch. Overall, this is pushing the vision of integrated CPU and GPU parts. The one reservation we have is that integrated graphics are fighting a step function. Low-end graphics that can support office applications are fairly nominal. Being able to have a “decent” gaming performance usually requires that you can drive your display at sufficient FPS. As display technologies trend towards higher resolution, additional GPU power is required for a decent gaming experience. 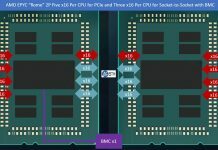 As such, the bar is constantly being raised for APU designs which AMD is racing to hurdle. These APUs will be rolling out over the next few weeks/ months to meet that demand before the Ryzen refresh in April 2018. The R3 2300U (and its PRO version) are the most exciting ones if price is right. Would love them in very small desktop PCs for office work.